I discovered a technique on Lisa Vollrath's site (LisaVollrath.com) called Crumpled Inking. It required a bare minimum of supplies and so I thought I'd give it a try. My first attempt is on the right, using a paper somewhere between printer paper and cardstock in weight. I'm not too happy with the results, because I think the crumpling is too 'heavy' looking. The second attempt is better because I used a lighter weight paper and I liked the resulting texture better. I'm doing two experiments with this post. I'm going to be away tomorrow, so I'm hoping I can manage to have this appear while I'm gone. Moving into uncharted territory again, so don't be surprised if it doesn't work! The picture shows three versions of my other experiment. Supplies used were basically just some watercolour paper, old folk art paint, gesso, a cheapie paintbrush & some water. Basic technique: I coated a piece of watercolor paper (cold press - 90 lb) with gesso & let dry. I used a light coloured folk art paint, watered down to a fairly runny consistency and then glopped over the dried gesso. Let dry. Layer three: another coat of watered down paint in a different colour. Let dry. Layer four: another coat of watered down paint (quite watery consistency), which I left on for a few minutes and then blotted off. Hints: I found that I liked a fairly textured coat of gesso to begin with. The first layer of paint should give a fairly solid colouration; the second coat looks best brushed on and then dabbed off slightly in order to let the first colour show through. Gold looks nice as the top layer! I finished making this padfolio today and am fairly pleased with my first effort at doing one. I wish I had thought to put a 'holder' for a pen inside and think I will with the next one. The original pattern can be found here: www.suebleiweiss.com (thanks Sue!). Further modifications might be to make it all without having to satin stitch the pieces together. Satin stitch and I are not on the best of terms and I have a horrible time getting it even. I generally avoid it at all costs because I don't like the frayed 'bits' hanging out the sides. Think I will try some fray check all around it to see if that cuts down on the fuzziness. Of course I don't have the correct size pad of paper to insert in it, but you can get the general idea I think. All in all, I love the pattern and am very likely going to make a couple more (minus the satin stitch tho!). These are the atc's I received today in our CQTeer swap. One picture shows the ones I got with the theme of 'men' and the other picture is some miscellaneous ones. Spending the day at the meeting means I haven't accomplished anything else. We made a folded paper book technique which was interesting, provided I can remember how it was made! It's very hot here right now and we need rain desperately. Our garden is practically laying down in heat prostration and if we don't soon get rain we can pretty much give up on anything producing. It's frustrating, but it seems that's the way the environment is going anymore. This time I scanned it, so hope it shows better. The picture quality is awful and I apologize. Of course I forgot to recharge the camera!! Anyway, I have been working today making atc's for the CQTeer group exchange. The set in the picture are done using the alcohol ink/photo paper backgrounds I did the other day. I did the ladies using the packing tape transfer method and stamped the word 'Joy' on black paper (which doesn't show at all in the picture!). The rose atc background is from a book of wood engravings, highlighted with a bit of blusher and eye shadow. Our topic this month was 'Men' and the quote on this says: "Men are like roses, you've got to watch out for the pricks". I'm really not intending to malign men generally, but you have to admit there *are* a few out there! My friend Kym and I had an interesting day playing with Adirondack Alcohol Inks and trying out different applications. I had a package of photo paper for the computer which worked out really well and will make great backgrounds for atcs. We discovered that it was best to put a light coat of rubbing alcohol on the photo paper first - otherwise the inks dried too quickly, as shown on the piece in the upper left of the picture. We also found that using makeup sponges dipped in rubbing alcohol first seemed to work well. The striped and the plaid piece - I put stripes of color onto a makeup sponge and then dragged it across the photo paper. We tried using it on old cd's and on bottle caps and were relatively pleased with the effect. I don't think my picture shows it to complete advantage. We tried sprinkling salt onto the wet inks too, but that really didn't work too well because the salt tended to absorb the inks too much. I think it would have been better had we used rock salt. Lastly we tried the inks on aluminum foil. I wiped some rubbing alcohol onto the foil first and then dropped ink onto it. You can see the results in the picture. One of the foil pieces I left flat and the other I crumpled after the inks were dry. Now it's on to making atcs with the results! Are you tired of these yet? Here's the latest tote, which I couldn't resist showing since it's very different than the others I've done. Still the cq style, but this time I made the rose the focal point and simply surrounded it with dark denim. I did the seams using a fancier stitch on my sewing machine and a red thread to tie in with the rose. The back pocket is a bit of a change too, and then I used up some large red buttons for highlights. I like this one! I finally got a copy of this book, which I have wanted for at least ten years (if not longer). I have tried without success to find one of my own after finding it at our local library. I finally resorted to begging the library to please put my name on it should they ever decide to discard it and today they did! I really shouldn't be so excited over a book that was published in 1974 I suppose, but it simply has caught my fancy. 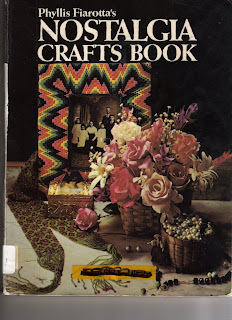 It covers all sorts of crafts, mostly from the Victorian times and the illustrations are wonderful - very little is in colour, but every page is a delight. You can see one of the pages in this post (click on it to enlarge) so you can get some idea of the eye candy inside. The only creativity done around here today was to frog-stitch some denim pockets so I can re-use them and lug two big totes of books to donate to our Friends of the Library group. Pictures of denim pockets aren't interesting, nor is used books! So...I shall mumble today about a few things. #1 - I'm being dragged, kicking and screaming all the way, into the computer age and am continually on a learning curve. Today Arlee invited me to join FaceBook. Yep...uh huh. One more thing I know nothing about. However, being that it was Arlee, I figure I might as well give it a go and with a sense of adventure have joined. 'Course now I have no real clue as to what to do with it now I've got it! However, it will come clear as I muck about I'm sure...won't it? #2 - No rust experiments being done at the moment because I'm waiting patiently for DH to remove the door off the chimneria (sp?) which is a cool grid pattern I can use. He claims he doesn't care if I get it rustier than it already is. #3 - Kym dropped in yesterday and told me about using copper pipe and ammonia to create interesting effects and I'm waiting for her to send me the actual recipe. Apparently it turns fabric somewhat into a vertigra coloration, which sounds really cool. Think I should be able to combine it with my rusty 'stuff'. Need to rummage around in the men's domain again to see if there's any copper lying around anywhere. #4 - Kym also relieved me of a filing cabinet and a chest of drawers which were destined for removal from my workroom. Yes! - two more things gone. #5 - Speaking of 'gone', I finally convinced DH that he really should go through his woodworking magazines, carving books and gardening books and cull out the collection. The magazines have all been sitting in the closet for over 8 years and never even been looked at and I know they won't. 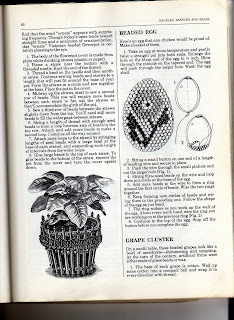 He has lost interest in carving and the gardening books are rarely looked at (only a select few that he really likes). Well, we lugged 4 large totes of magazines & woodworking books out to a man who actually might use them yesterday. AND, we took 2 large totes to the libary today of the carving/gardening collection. Wow! I never thought a man would EVER part with anything and he did! There's still a couple of piles of carving magazines to go. We have gained 4 shelves of space in the closet out of all this too. Woo hoo!! I guess seeing me get rid of all the excess out of my workroom has inspired him. 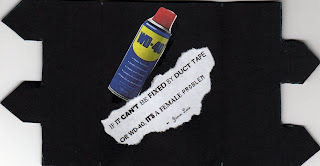 Now, if only the men would do the same with the garage/workshop...sigh. #6 - Question - can anybody tell me how clothes manage to shrink while they're hanging in the closet? It's one of life's mysteries. #7 - All this cleaning and culling I've been doing has proven to be so very satisfying. The sense of guilt I've been carrying around for too long is lifting...guilt because I wasn't actually doing anything with the 'stuff' I had and, because it was sitting there, it weighed on my mind and soul. All the wonderful (at the time) instructions for this and that I had printed from the 'net don't appear so wonderful now. My tastes have changed and I look at something and wonder what on earth I found so enticing about it in the first place. Now I intend to only print off something I will actually use/do within the week...otherwise, let it go. Artistic/crafting trends change so rapidly right now and there's no sense keeping what is 'old news' - besides there's a wealth of info on the internet at any given time and lots of search engines to help me find it! Looking around my workroom now and seeing actual space (!) on my shelves and space on my walls is so gratifying. Oddly enough, I don't even feel guilty about getting rid of a lot of my craft books, some of which I've spent an insane amount of money for. The ones I'm keeping are the ones I intend to use now. If I don't, they too will go. Set them free so others can enjoy them!! On that note, enough mumbling for today. ...is what I've accomplished today, unless you count such mundane things as laundry, taking dogs for grooming, getting some groceries, and cleaning out a closet. I can't disappoint my reader and have no post so, guess what, another book review! 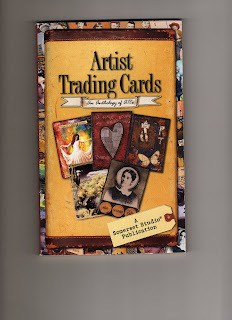 Anyone who is interested in ATC's would enjoy looking through this book. It is mostly eye candy, with some text. I really like the book, but anyone who can feel overwhelmed by 'busyness' might find it a bit over the top. It's a small book, measuring approx. 5x8" with 96 pages. Decided I'd better get busy and get caught up on my TAST project. I haven't done much in the way of satin stitch (week 22) that is 'showable', but I did do this needlecase a long time ago and there's some satin stitch on it, along with a few other stitches. I really need to make myself a new case, if only to reflect more modern colours! 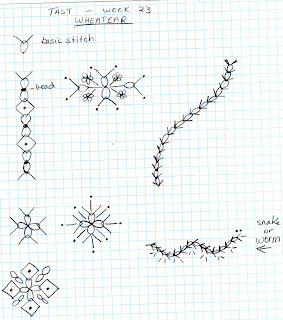 The wheatear stitch (week 23) is a fun one. I can see all sorts of possibilities for this, primarily for motifs and as a filler stitch (possibly for an underwater scene?). Maybe with flowers as a vine? I think it would make a cute worm or snake too! ...or I could show another tote, but I think you might be getting bored with them! 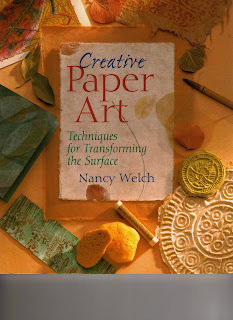 I love this book and would highly recommend it to anyone interested in techniques involving paper. To mention a few of the techniques: sponging, bubbling, plaster, dyeing, marbling, webbing, embossing, and many more. There are also a number of projects. The pictures throughout are inspiring and, once a technique is described, there are lots of suggestions as to how to explore it further. All in all, I think this one is worth the money. This tote was once a dress. 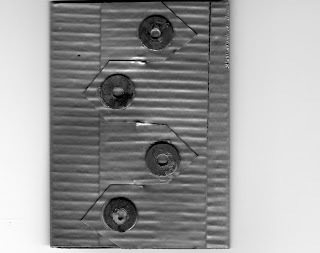 Enlarging the picture (clickable) will show you that the 'details' are all zippers. I'm really happy with this one. Despite my best efforts, the denim stash doesn't seem to be reducing any. Rabbits got nothin' on my denim, let me tell you...I swear it's multiplying when I'm not looking! Anyone who likes beading, might want to check out this blog: http://beadjournalproject.blogspot.com There are a number of great links leading to some pretty great artists, plus an interesting discussion about the current Bead Journal Project. Nothing I make could ever compete with the beauty in our garden right now! Please enjoy your stroll through the flowers. I know, I know..."rust" is becoming a four-letter word, however my creative time today was severely limited, so this is another picture I took yesterday of my 'cooked' rust project from the weekend. I'm really liking the effect (can't you tell??). OK Arlee...I'm accepting the challenge and will see what I can create with all my rust experiments! It's going to be totally outside my realm of comfort, I can tell you that, but I'm really excited about it. We were away for the weekend, so I apologize for the no-post on Saturday. While we were away I left another 'experiment' cooking out in the sunroom. This time I tore apart a steel wool pad and included it with my other rusty bits when I rolled the fabric up. Dosed the whole thing with vinegar and left it. When I checked it this morning and unrolled the fabric I was totally amazed to discover the entire steel wool 'bits' had totally disinitigrated and there wasn't a trace of it left! Wow. Now I gotta root through the garage and see if I can find some more for the next piece. The picture today is of what I saw when I first looked at it this morning. I couldn't believe the pattern that was left in the plastic container, never mind what the fabric looked like! This is way cool and I'm planning to use the pictures I took in my wallhanging...somehow. This whole process is exciting!! Yep, I'm beginning to think I'm a bit possessed by this rusting technique! Now I just have to figure out what I'm going to actually do with it now. I've been toying with making a cq-style piece, using chunky beads and metal nuts, bolts, etc. (maybe a wallhanging). Or...a fabric book of sorts. Or...use for backgrounds for atc's. Decisions, Decisions!! Right now I'm at the point where I have no orders for anything or gifts to make, which means I can actually do some art. It's almost scary because I so rarely have nothing pressing that needs doing. I think the last time might have been two days back in 2002!! What to do, what to do? I know!...make more rust!!!!!!!!!! Just feast your eyes on this neatly organized shelving unit AND the huge bag of cast-off denim heading to the recycling! I have down-sized my denim stash by about half and after I finish the current projects, the rest will be going too. The red bin holds my bits of more interesting denim, such as flowers and neat zippers, etc. The blue bin holds pockets. The bottom shelf currently holds my quilting bats and toy stuffing. The brownish thing on the top shelf holds my cat Cosmo...sound asleep when this was taken. I'm recycling, with a vengeance! There are three huge bags of fabric going out to the recycling tomorrow AND I've filled another large bin with 'stuff' like what you see in the picture. I have an entire filing cabinet *full* of patterns/downloads off the internet/ideas and the lion's share of it is destined to go out, out, out. Why on earth do I feel I have to print out every single thing I see that I just might (key word is 'might'!!) want to do someday? 90% (or more) of it I've forgotten I even have. Yikes. What you see in the picture is just a mere fraction of what I chucked today. Yeah, me!! Here you see the finished block for the friendship/cancer quilt that I started yesterday. Even I'm impressed at how fast I finished it! I didn't do any beading on this because it's most likely the only CQ'd piece in the quilt and I wanted to be sure it would be washable. All I have left is to put my name on it and deliver it to the organizers. On another subject entirely - I've noticed a number of people in blog-land talking about coming to the realization that they are compromising their own artistic selves in favour of 'following the crowd' and attempting to try everything new that's out there. Keeping up with the Jones's, so to speak. I found the discussion on http://arleebarr.squarespace.com/designjournal to be particularly on-the-mark. I had been toying with the idea of signing up to do an altered board book swap in one of my groups, but Arlee made me really stop and think about my motives and I've realized that I really don't want to get involved in any more outside projects, just for the sake of trying/learning something new. My wish-list of projects has simply gotten too long and I never seem to manage to get around to doing any of them. So....I didn't sign up for the swap (yeah, me!) 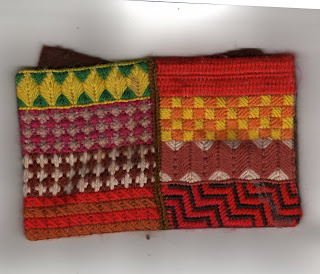 AND I also didn't sign up for the Bead Journal Project, despite really wanting to (double yeah, me!). Another thing I've noticed on the blogs is that there is a 'movement' out there to downsize stashes and use up what you've got. Perhaps the two subjects are related? I know that's where my focus is right now. I have stuff I have forgotten even getting...even things I've purchased and never taken out of the package (all because I was trying to keep up with the trends). I've put the brakes on buying anything new and it really feels good. I have enough stash to make at least twenty crazy quilts and an entire (large!) shelving unit jammed with recycled denim. I think that can keep me busy for quite some time! Two pictures today. The flower is a night-bloomer in our garden and is absolutely gorgeous. We have to be careful though, especially in the spring, because the foliage looks suspiciously like a dandelion and it's altogether too tempting to haul them out without thinking. They bloom from now through most of the summer which is quite remarkable. It's fun to sit outside at dusk and watch them open. First they start to tremble and within about half an hour they've gone from bud to full bloom. This happens each and every night with varying numbers of flowers on each plant. The crazy quilt block is one I'm working on in a hurry for a special quilt being made for a member of our quilt guild who is undergoing treatment for cancer at the moment. A number of us are each making a block (of any sort) which will then be put together into a 'friendship and prayer' quilt for her. I have less than a week to do my part, so I'd better get busy! OK...who would have dreamt? This is my first (but not my last!!) attempt at rust dyeing. I've been reading about it on different sites on the 'net and decided that I ought to give it a try and now I'm hooked. Of course the men in my family think I'm more than ready for the one-way ticket to the insane asylum. They simply couldn't figure out why I wanted 'rusty stuff' from the workshop. "What - you want THAT nail? - it's RUSTY - here, this one is much better" were just some of the comments I got while I dug about in what they consider to be their domain looking for treasures. I made a mixture of vinegar and some salt (added a bit of water, but didn't need to), wetted down a piece of waste fabric (this piece is cotton) and wrapped the rusty bits into it. I put the whole mess into a plastic dishpan and set it in the sunroom to cook. Keep it moist for a day. This morning I unwrapped my experiment and this is what I got!! This is exciting and, better yet, cheap to do. I rinsed it well and hung it out to dry. DH promptly informed me that the neighbours would be thinking I was hanging out something covered in poop (argh...no appreciation for ART). I was so excited that I immediately put another piece of fabric on to cook. Can't wait. More denim and cotton used out of my stash to make this tote bag. I thought I'd do this one using the crazy quilt method I use for the jackets and I'm pleased with it. I think I'll make a couple more of these and put them away for gifts. There are two pockets on each side of the outside and I put two more inside so there's lots of storage. It's a great way to use up stash, however - how come it doesn't look as if I've even touched it? ?